I’ve been running seriously for nearly 30 years now, and have no intentions of giving it up for at least a few more decades. Marathons, trails, obstacle courses, sprints, I love it all! In the last five years, yoga has become a non-negotiable in my workout routine – a must-do after long runs, speed-work, gym sessions, and sometimes even in lieu of a workout when I just need some active recovery. A lifelong competitive/elite runner, now competing at the Master's and/or Super Master's level. 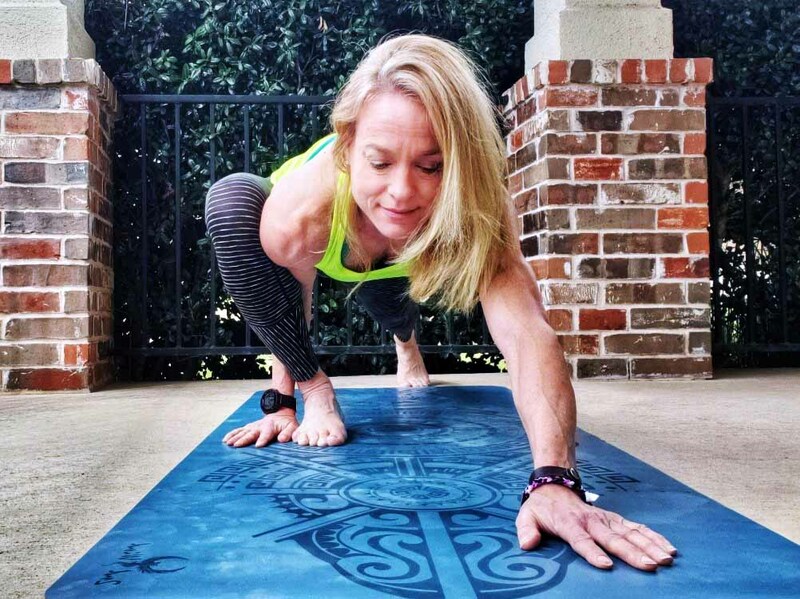 Yoga is helping her stay competitive, race, and shatter her own goals time after time. My message to others is always that you are NEVER too old, out of shape, or nonathletic to try something new or set an audacious goal. When I was younger, I could run far and fast without incident and never gave much thought (or action) to stretching, mobility, or yoga. 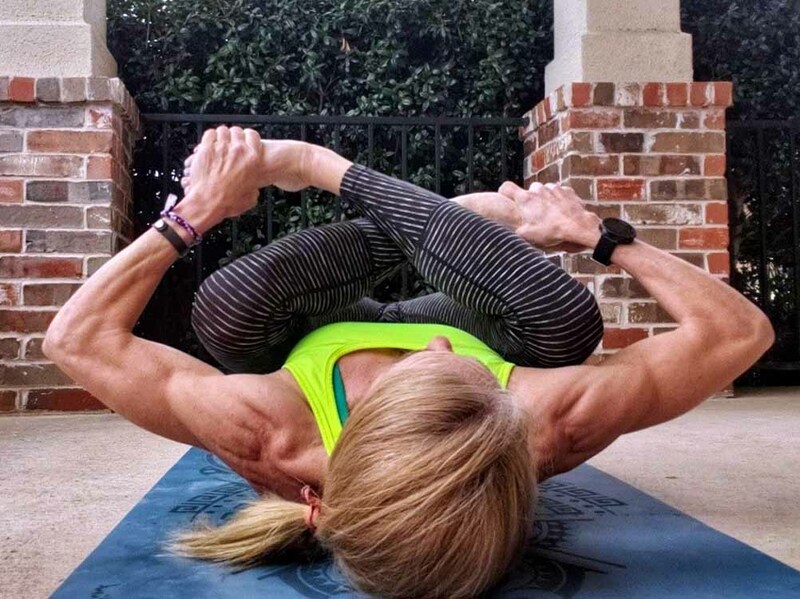 However, as the years past, and I had to work harder to stay in the proverbial game, I realized I needed a comprehensive strategy to help me stay healthy, well and injury free --- and yoga was a natural fit in that plan. Taking an hour or 90-minute yoga class in a studio is a luxury I often can’t spare the time for, but by just practicing yoga and moving through a 15-minute flow on my 2nd Wind Yoga Mat at home helps me stretch the muscles and ligaments that get so overused in running – this helps to prevent future injuries as I’m getting older. Plus, it slows my go-go-go personality down and lets me relieve stress and relax. Let me share with you four yoga poses for runners that I can’t live without – and how to do them. They are 1) Lizard Pose, 2) Half Split, 3) Standing Forward Fold, and 4) Reclining Cow Face. 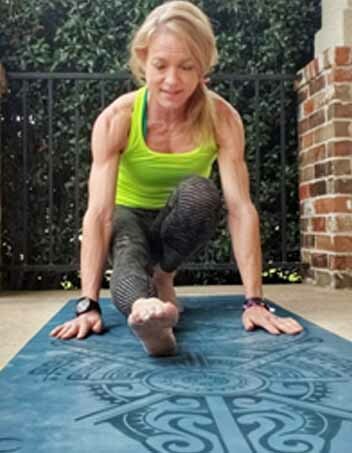 I often do MORE than these four poses, but these four simple poses are the foundation that I come back to time and time again to activate and stretch my notoriously tight runner’s hamstrings, glutes and hip flexors. Lunge forward with one leg, bent at the knee, and stretch other leg back forward low to the ground, sinking weight into your hips. Lower onto forearms is able, to further work the stretch, holding for 5 to 10 counts before repeating on opposite side. 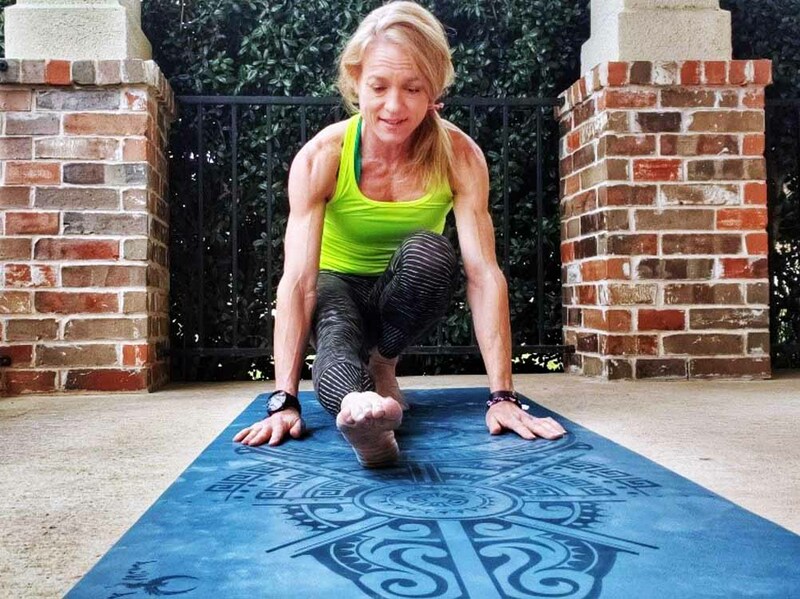 This effective runner’s yoga post works hip flexors, hamstrings and quads. When coming out of lizard pose straighten bent leg while folding straight leg underneath you and sinking down as far as you can, feeling the stretch in the hamstring. 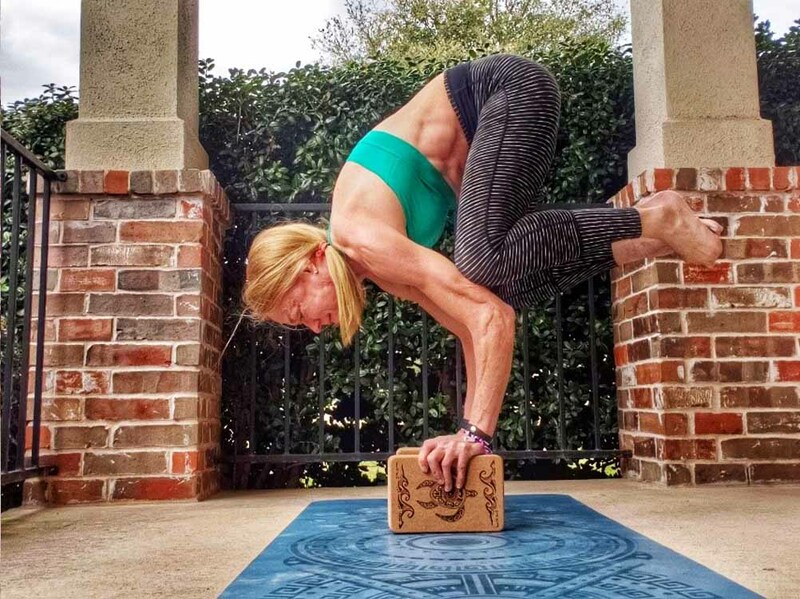 If you are not able to sink low enough to use hands for balance on the ground, use yoga blocks for a modification (I love the cork yoga blocks from 2nd Wind, they are substantial feeling under my weight and can be positioned for several different height modifications). Stand with feet slightly apart and bend forward, hinging at the hips and lengthening the torso. Let crown of your head hand down and lift your sit bones toward the ceiling. If able, press palms into ground, or grab elbows with opposing hands, or use yoga blocks (like I am) for a modification that suits your ability. Hold for 5 to 10 counts. I like the standing version of this pose rather than seated, so that I can let gravity help do some of the work and often use yoga blocks to help meet me where I am. Lie on your back and cross legs, knee-over-knee, with feet pointing out to the sides. Hold feet or shins with hands and pull heels in towards your body, and then slightly out to stretch further. Hold for 5 to 10 counts and then repeat with legs in the reverse knee-over-knee position. You will feel the stretch in your glutes, hips and hamstrings. Other poses I like for running recovery are bridge, triangle, pigeon, upward dog and downward dog. Of course, I wouldn’t be ME, if I didn’t throw a few challenges into my daily yoga practice. I really rely a lot on the cork yoga blocks from 2nd Wind to help me with these harder poses. It doesn’t sound intuitive, but for me, using yoga block for crow pose makes it easier as it takes the pressure off my arthritic thumb joints. Also, they make a great way to get a “boost” if you are practicing an L-sit or raised lotus. Yoga gear from 2nd Wind helps my yoga practice and my yoga practice helps my running. It’s all related. Plus, I love the name “2nd Wind” and how it implies that taking a yoga break can help any type of athlete or active person jump back into his or her choice sport with a renewed vigor. 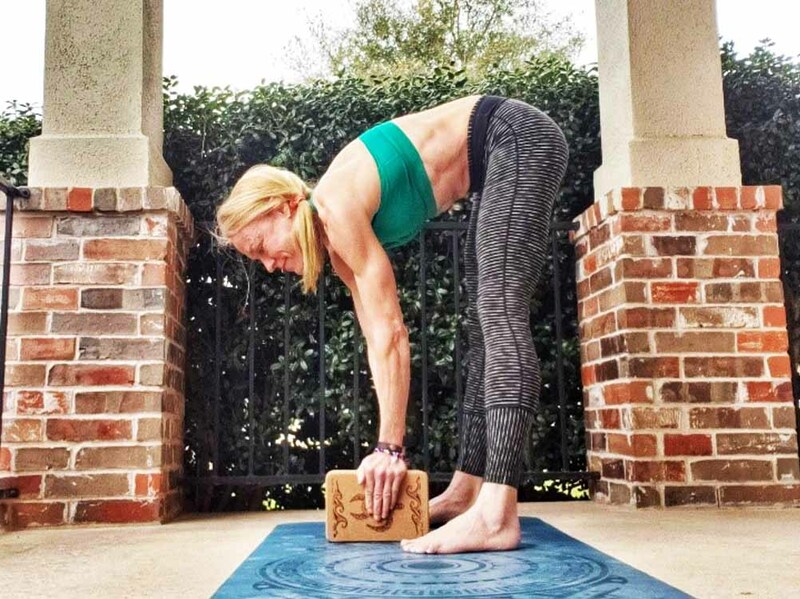 I already talked a bit about the cork yoga blocks from 2nd Wind Health – they help you to get deeper stretches, work toward new poses, and accommodate limitations (like my basal joint arthritis). They feel sturdy under my weight, are easy to hold onto and don’t slip around on the ground. Another perk is that cork is a self-cleaning, hypo-allergenic, anti-bacterial natural material – so much more eco-friendly than those foam cheapie ones too! 2nd Wind understands yoga for runners and other athletes and also the variety in our needs. 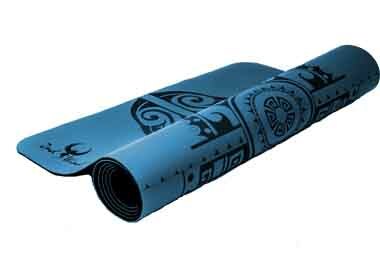 They make a variety of yoga mats to suit the style of your practice including cork yoga mats (that grip really well when wet), sticky yoga mats (extreme grip in any environment, including hot yoga), and towel-infused mats (towel-like material actually baked into the bottom rubber layer). 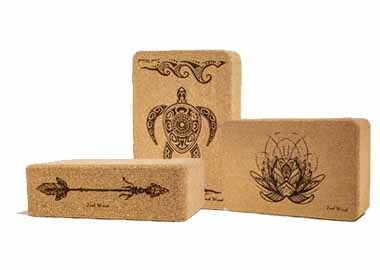 I’m practicing on the Sticky Yoga Mat in Caribbean Blue and using a pair of the Cork Yoga Blocks in the Turtle design. Lifelong competitive/elite runner, now competing at the Master's and/or Super Master's level. 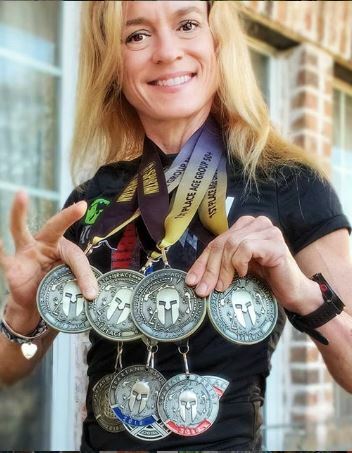 In 2017, her highlights included Texas 10 mile State Champion (female supermaster), 3rd in the National CG Games Finals (super master division), qualified and finished Spartan World Championship in the Elite field, 16th in S.Central US region CrossFit Open (50 -54 division). Perfect for anyone who requires uncompromising grip, and primarily practices in non-heated classes when in the studio. Features a unique design to help with alignment. Designed narrower at 3x6x9in these blocks allow you to exert more grip strength and alleviates pressure on the joints and tendons while building strength. Natural cork, self cleaning, and grip isn't lost when you sweat.